Seattle Music Insider founder and Chief Contributor, Greg Roth, is unique in the world of music journalism. Not only is he a multi-media journalist, he is also an accomplished musician. His years of writing, arranging, and performing live music in a variety of genres inform his ability to communicate the message and the mechanics of music. Roth interviews a wide variety of artists, from classic rockers and contemporary acts, to up-and-coming local bands. Roger Daltry (The Who), Lee Oskar (WAR), Alan White (Yes, Plastic Ono Band), Tony Levin (Peter Gabriel, King Crimson), Adrian Belew (Frank Zappa, David Bowie, Talking Heads, King Crimson) Thomas Dolby, Jeff Lynne (ELO, Traveling Wilburys) Urge Overkill, Blues Traveler, Wheedle’s Groove, Fitz and the Tantrums, Phantogram, Vicci Martinez, Allen Stone, Star Anna, Hot Bodies in Motion, Pickwick, Lemolo and Perry Acker are just a sampling of the artists he has spoken with. Roth is a fixture at events such as Bumbershoot, Synergia Northwest, Sasquatch, and Capitol Hill Block Party, providing a unique insider take to an otherwise public event. Along with interviewing artists, Roth enjoys shooting live shows. 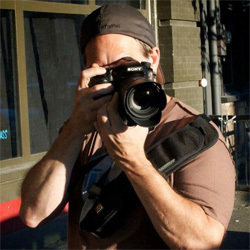 He has shot several shows throughout the region and festivals including, Bumbershoot, Sasquatch, Capitol Hill Block Party, Bite of Seattle and more.